Item 868 Special Price $48.95Can or $36.53us Brand New. Cheapest MyGica is ethernet-ready (No WiFi) ATV510X, surf all the internet. Item 868: Special Temporary Price $48.95Can or $36.53us Brand New. 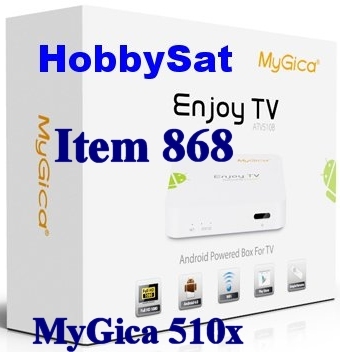 MyGica ATV510X Linux Only XBMC/Kodi TV Box $48.95 for your Big Screen. You're just one step away from turning your TV into a Smart TV. so it boots directly into XBMC (the worlds premium open source media centre). for those only using XBMC Media Software. USB HDD or from any computer connected to your home network. Capable of 1080P playback, Dolby Digital audio encoding/decoding 5.1 Surround. Watch your movies the way you want. *****Please note this item comes in generic gift box packaging and not exactly as shown and is ethernet connection only, no WiFi. •	CPU: ARM Cortex A9. •	External NTFS HDD Compatible. •	Built-in 802.11 b/g/n WiFi. •	Supports simple IR remote control with mouse function. •	Supports Micro SD card. •	RJ45 10/100M Ethernet interface. •	HDMI video output, connect to HDTV for HD video playback. 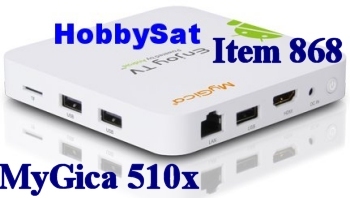 •	MyGica ATV510X Linux XBMC Only TV Box. Product: Android ATV 510X TV box. USB: Supports 2x external USB HOST. Micro SD card: 1XSD slot. Remote control: 6 Key IR remote included. HobbySat carries the North American versions of MyGica Products.